It is not a shining moment for science or for law. Indeed, the story reads more like a gripping thriller — one that the reader finally sets down by the side of the bed at 3 AM thinking that it was an exciting enough tale to forgo sleep even if it was totally unbelievable. Imagine the plot summary. A physician, receiving handsome payments from an attorney who wants to bring a class-action suit against a vaccine manufacturer, invents a fictional disorder and fabricates data to establish a fraudulent link with the vaccine. The stuff of Ian Fleming or John Le Carre. 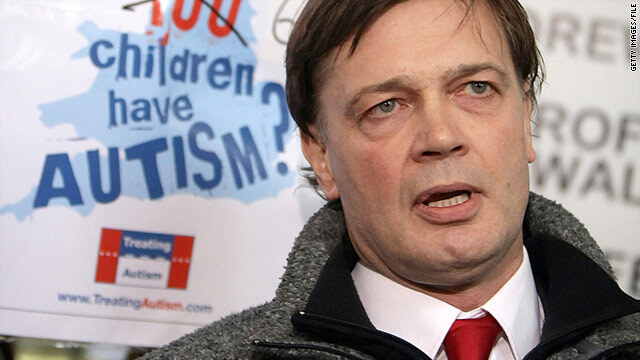 In 1998, Andrew Wakefield and twelve other others published a paper in Lancet, a prestigious medical journal, implying a link between the measles, mumps, and rubella (“MMR”) vaccine and a new syndrome of autism and bowel disease. Many scientists were skeptical, pointing to any number of scientific weaknesses in what was reported. But large segments of the public relied on the paper when its findings were reported in the general press. Vaccination rates plummeted as parents determined that the risk of autism in their children was too great. The inoculation rate dropped most dramatically in Britain, from about 92% to below 80%, but many children in other parts of the world also failed to receive the MMR vaccine as a direct consequence of the Wakefield paper. 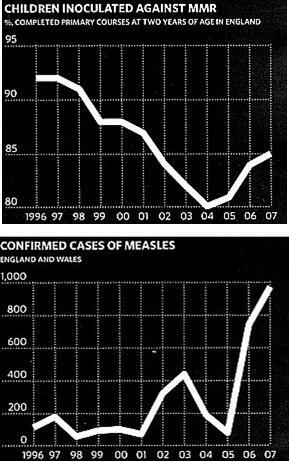 From having been declared “under control” in the mid 1990’s in Britain, measles was declared “endemic” in Britain only ten years after publication. The U.S. Centers for Disease Control notes that more cases of measles were reported in the United States in 2008 than in any year since before publication, with more that 90% of those having not been vaccinated (or having a vaccination status that was unknown). A series of articles being published in the British Medical Journal began last week, exposing a fraud surrounding the paper that author Brian Deer likens to the Piltdown Man scandal, an elaborate hoax that disrupted the natural course of paleontology research and that took decades to uncover. I briefly discussed Piltdown man some months ago here. Deer describes how Wakefield was retained by attorney Richard Barr two years before the paper was published, and paid more than £435,000, six times his annual salary as a physician. The children in the “study” that he conducted on MMR were targeted and preselected to have desired symptoms, he reinterpreted clinical records to suit his contrived syndrome, and “chiseled” histories to reach unsupported clinical diagnoses. While admonishing many who failed to exercise sufficient diligence — coauthors, fellow scientists, hospital managers, journal editors — Deer reports that the evidence shows it was Wakefield alone who perpetrated the scandal and that not even the attorney who paid him knew what he was doing. When Deer first reported on irregularities surrounding the study in 2004, ten of Wakefield’s coauthors retracted the interpretation. In January 2010, a five-member tribunal of the British General Medical Council found dozens of allegations of misconduct proved, including four counts of dishonesty and twelve involving the abuse of developmentally challenged children. A copy of the results of the Fitness to Practise Hearing, which was the longest ever conducted by the Council, can be found here. The consequences of the misconduct are truly staggering. Epidemiological studies were conducted at great public expense, unable to confirm any link between autism and the MMR vaccine. Research funds and personnel were diverted from more legitimate avenues to understand the actual causes of autism and to help those affected by it. Many children who might otherwise have been vaccinated suffered an illness that we have the technology to prevent and may be among the small number who died as a result of having contracted measles. At the moment, the effect on mumps contraction remains unclear because its peak prevalence is in older adolescents. In its editorial, the British Medical Journal pulls no punches. It asks whether it is possible that Wakefield was wrong but not dishonest. After all, scientists are allowed to be wrong. Indeed, it is a strength of the scientific method that all honest ideas should be considered so that they can be scrutinized and dismissed if they are incorrect. Not a single one of the case studies was reported accurately. The pattern of the misreporting shows an intent to mislead. Already actions are being taken to examine Wakefield’s other publications, mindful of the experience that misconduct is rarely an isolated event. When I write about various issues on this blog, one of the things that I am reminded of repeatedly are the similar ethical requirements that attorneys and scientists are expected to adhere to. Those ethical requirements exist because of the importance of the work that they do, and the trust that is necessarily placed in them by the public. Attorneys suffer a great deal from distrust by the public, and I have always thought that that is one of the prices to be paid for the system. Attorneys deal with controversies between parties that have opposing interests and operate in a system that requires that the best arguments be put forward on behalf of their clients, most especially for those clients who seem unlikeable and potentially subject to victimization if the state or other opposing party is not held to the strictest standards of proof. Scientists have generally enjoyed a more favorable reputation by the public, but misconduct of this scale has repercussions that extend far beyond even vaccines and autism. Such acts of misconduct erode public confidence in the legitimate conclusions of science, putting members of the public in a circumstance where they do not know who or what to believe. They are inconsistent with the openness that is the very bedrock of science, which seeks to communicate not only what we do know but also what we don’t. Because if people are to make decisions in their lives based on the results that science achieves, they deserve to know both. The quotation is from the Fourth Assessment Report issued by the Intergovernmental Panel on Climate Change (“IPCC”) in 2007. It’s a sobering statement about the impact and pace of global climate change — an astonishing vanishing of the glaciers of the Himalaya in only 25 years. The categorical nature of the statement has caused much criticism and embarrassment for the IPCC, which has significant impact on the formation of laws to implement climate policies by nations around the world. It does, however, provide a fitting example of the role of scientific peer review and the sweeping impact that errors in that process can potentially have. The IPCC was formed in 1988 by the World Meteorological Organization and the United Nations Environment Programme. Its principal role is to assess the scientific information available about climate change and to issue assessment reports that are used by governments in developing laws and policy. Together with former Vice President Al Gore, it was awarded the Nobel Peace Prize in 2007 for “efforts to build up and disseminate greater knowledge about man-made climate change, and to lay the foundations for the measures that are needed to counteract such change.” There is no doubt that when its credibility is tainted by bold statements that turn out to be false that it fails, at least in part, in achieving that goal. The incorrect statement apparently has its origins in a statement made by Syed Iqbal Hasnain, an Indian scientist, in 1999. He claims he was misquoted in an interview with the science magazine New Scientist: “I had simply told the New Scientist in an interview that the mass of the glaciers will decline in 40 years…. The date (2035) was their invention.” He acknowledges that his statement itself was based on data published in the 1970’s. Another of the peer reviewers noted that the statement seemed to be at odds with other research suggesting that glaciers in the Himalaya are actually expanding, pointing out specific references that should be consulted in assessing its validity. The end result is that the report failed to account for the criticisms of the peer reviewers and instead retained a statement that was not itself validated by peer review. In the time since the error has been pointed out, there have been numerous allegations whose veracity is hard to assess: that the statement was included deliberately, even knowing it was wrong, to prompt action by governments; that Hasnain is being untruthful when he claims not to have mentioned a date; that those involved with publication of the statement have financial interests that would be enhanced by concerns the Himalayan glaciers are rapidly disappearing; and others. Any of these would be cause for additional concern if substantiated, but my focus today is more narrow: The peer-review system worked up to a point, with peer reviewers identifying the weaknesses in the statements. But it takes attention and diligence on the part of all involved with that process for it truly to function the way it is intended. Last week, the InterAcademy Council (“IAC”), a multinational organization of scientific academies, issued its Review of the IPCC. While it noted an “essential” need for “some fundamental changes to the process and the management structure,” its tenor was generally positive about the contributions the IPCC has made: “[T]he IPCC assessment process has been successful overall and has served society well. The commitment of many thousands of the world’s leading scientists and other experts to the assessment process and to the communication of the nature of our understanding of the changing climate, its impacts, and possible adaptation and mitigation strategies is a considerable achievement in its own right.” The full report can be read here (a discussion of the Himalayan glaciers statement begins on page 23). Coincidentally, the U.S. Geological Survey released its image atlas on “The Glaciers of Asia” only about a week before the IAC’s report, providing evidence that the Himalayan glaciers are, in fact, receding, although there is still conflicting data about what is actually going on there. That atlas can be seen here. There is no question that the credibility of the IPCC has been damaged and deservedly so. Himalayan glaciers are vital. Even Al Gore noted in his movie that the Himalayan ice sheet feeds seven of the world’s major river systems, providing water to some 40% of the world’s population. Statements about its demise should not be made lightly. But at the same time, it is important not to lose an appropriate sense of context. Global climate change is incredibly complex to understand and the volume of information considered by the IPCC in issuing its assessments is large. Nations very much need a body to aid in the digestion of the scientific information and to provide carefully considered evaluations of the implications of that scientific information. This is one of the most famous hominids ever discovered. But certainly for the wrong reasons. It was 1912. Very few hominid fossils had so far been found. Neanderthal Man in 1856; Cro Magnon Man in 1869; Java Man in 1890; Peking Man in 1903; Heidelberg Man in 1908. Each of these discoveries had added a small piece to the great puzzle of modern man’s origins, but there was still no clear species that represented a clear link in the evolution between ape and man. In a way, that changed with the 1912 discovery of the fossil remains of a hominid — identified as eoanthropus dawsoni after the man who discovered them — that clearly showed a mix of features between ape and man. Found in quarries in Sussex, England, the skull was similar to that of modern man, but would hold only a brain about two-thirds the size of a modern brain. And the jawbone was decidedly more apelike. The combination supported the theory that the evolution between ape and man would begin with the brain so that the skull would evolve before the jaw into a form closer to what exists today. There were skeptics, mostly among French and American paleontologists. But there were also those who saw the discovery as a critically important one, particularly British paleontologists in a pique of nationalist pride. But as time went on and further hominid fossils were discovered, it became increasingly difficult to fit eoanthropus dawsoni into the developing framework of human evolution. Experts perhaps puzzled over it at times, recognizing it as anomalous. It would be forty years before the discovery of the fossils — made in the quarries of Piltdown — would be discovered to be a fraud. It was an elaborate hoax perpetuated by someone whose identity remains a mystery today, even though there are various theories about who it might have been. Certainly the fossils had been carefully prepared to make them look far older than they actually were, and it was with the use of much more modern dating techniques that the fraud was ultimately exposed. The preparations clearly required knowledge about the techniques that paleontologists would use in analyzing the fossils, making the hoax seem elaborate and almost sinister. The four-decade episode of Piltdown Man is an instructive one, exposing the limits that may exist with scientific analyses and the ability of some to exploit those limits to mislead. The more recent episode of “Climategate” is an attempt to suggest that a similar hoax is being perpetuated by some climate scientists today. The episode began in November of last year when a variety of emails and documents were hacked from the University of East Anglia’s Climatic Research Unit computers. Through a rather selective citation of isolated phrases out of context from stolen documents, a scandal was orchestrated, accusing the scientists who were quoted of colluding in a campaign to withhold scientific information, to manipulate data, and to interfere with the peer-review process in order to perpetuate a hoax of increasing global temperatures. One particular focus of the allegations has been language in an internal email related to the famous “hockey stick” graph that shows sharply increasing global temperatures in modern times. It is a private email written between two scientists and needs to be understood in that context. It undoubtedly refers to a “trick” used to “hide the decline.” But scientists use the word “trick” to describe something clever or insightful to deal with a difficult issue — not as something deceptive. And the decline that is referred to is well-known in dendroclimatology in which the properties of annual growth rings of trees are used to infer temperature changes. The fact is that since about 1960, tree-ring data has tended to suggest a decline in global temperatures at a time when direct instrumental measurements of temperatures show that it has clearly increased. Before 1960, tree-ring proxy measurements are consistent with other proxies for temperature change at least back to about 1600 AD. Something is obviously amiss with tree-ring proxy measurements, at least after 1960, although the reason for the divergence is not understood. What the Climategate scientists were referring to in their exchange was a known way of dealing with this inconsistency. It is important to recognize that they were not “fooling” anyone — the anomaly with tree-ring data is well-known among climate experts, as is the statistical “trick” used to legitimately reconcile the different types of data. 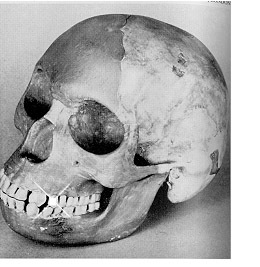 The history of Piltdown man reminds us that we need to be on guard against scientific misconduct and fraud. But we also need to be on guard against unwarranted allegations of such misconduct when there is no sustainable evidence to show it is there.